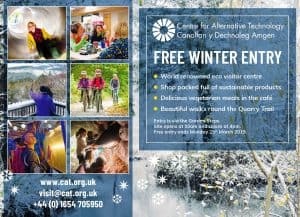 Over the winter months, the Centre for Alternative Technology (CAT) will be welcoming thousands of visitors free of charge. CAT is fully equipped with everything you need for a great day out. Visitors can explore working examples of renewable energy, discover sustainable buildings and techniques, walk round organically managed gardens and learn about land management and the history of CAT on the Quarry Trail Walk through sustainably managed woodland. CAT’s shop is packed full of great sustainable gift ideas and the café is serving hot tasty vegetarian meals every day. CAT’s playground will also be open as normal to help the littlens run off extra energy.